Complimentary, authentic, bespoke event in Amsterdam. See AzAmazing Evening for complete details. 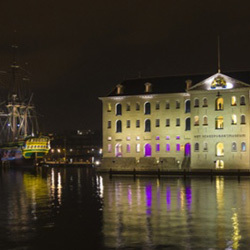 Celebrate the nautical traditions of the Netherlands during a musical evening at the National Maritime Museum. This grand building will forever be remembered as the Arsenal, hub of the busiest port on earth during the Golden Age. You'll arrive, appropriately enough, by canal boat and begin your evening with Dutch sweets and drinks. 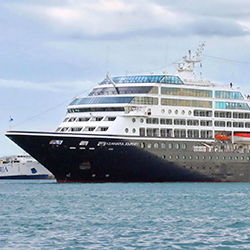 Your Azamara Captain or Cruise Director will kick off the festivities with a welcome speech before the Amsterdam Port Choir fills the night with music that echoes of seafaring tradition. Find yourself captivated by shanties and romantic songs that reflect the hard life and high hopes of mariners, past and present. Enjoy some time to explore the museum and board the mighty decks of the Amsterdam, a full-sized replica of an 18th-century cargo ship. You're sure to be singing the praises of the Netherland's seafaring heritage during this exclusive evening at its most acclaimed museum. Board a canal boat and relax on an evening cruise to the legendary Arsenal of the Admiralty of Amsterdam. Sip drinks, savor Dutch sweets, and marvel at what was once the focal point of the busiest port on earth. Listen as the Amsterdam Port Choir performs a selection of traditional shanties and seafaring songs in this inspired nautical setting. Suggested Attire: Walking shoes, comfortable evening attire. Activity Level: Leisurely walking over primarily even surfaces. There may be a limited number of steps, a minimal amount of cobblestones or uneven surfaces, and some standing for extended periods of time. This tour is equipped to accommodate guests in wheelchairs, motorized scooters, and those with limited mobility.